Moyamoya disease is characterized by the closure of one or usually both internal carotid arteries in the intracranial region, resulting in the formation of a fine network of blood vessel growth at the base of the brain. The term “moyamoya” was introduced to describe the hazy, puff-of-smoke appearance of the neovascularization that develops. This condition occurs more often in Japan but is found globally, and is most common in children younger than 10 and among adults in their 30s. Conditions associated with moyamoya disease include neurofibromatosis, tuberous sclerosis, sickle cell anemia, meningitis, retinitis pigmentosa, fibromuscular dysplasia, atherosclerosis, Down’s syndrome and Fanconi’s anemia following radiation therapy to the skull base in children. Children: Ischemic symptoms, those resulting from low blood flow, may include recurrent and sometimes alternating episodes of weakness, and speech and sensory symptoms. Others include seizure, involuntary movement disorders and intracranial hemorrhage, or bleeding within the skull. Adults: Intracranial hemorrhage is the most common symptom. Ischemic symptoms such as those found in children may also occur. 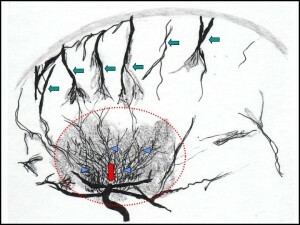 Cerebral angiography is the best method of diagnosing moyamoya disease. Characteristic findings are narrowing or closure at the termination of the internal carotid artery, abnormal vascular network and other related blood vessel formation. Selected patients suffering from recurrent or progressive cerebral ischemic symptoms may require surgical treatment aimed at revascularizing the flow of blood to the brain.